Available in 4 colors, this L-shaped desk can match almost any home office décor. This desk features two suspending pedestals for all your storage needs and features 3mm edge banding. 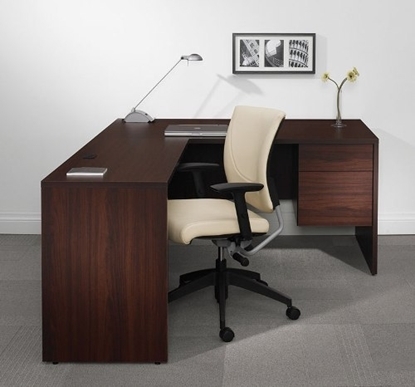 The Fairview L shaped office desk combines traditional detail and contemporary functionality. This Bush desk has a casual cottage style which would provide a comfortable addition to any office. Perfect for a laptop computer, desktop or tablet. Get free shipping when you order today! Combining traditional detail and contemporary functionality, Fairview's White L Shaped Desk with Hutch by Bush has a casual cottage style which would provide a comfortable addition to any home office or business. Features an Antique White and Natural Cherry Finish. Perfect for a laptop computer, desktop workstation, or tablet. Free shipping on all discount office furniture. Order today! 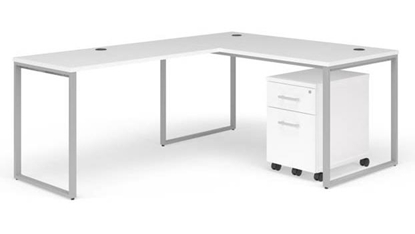 The Bestar Connexion L shaped desk with oversized pedestal provides the convenience of the L shaped design and the additional storage you will find beneficial. 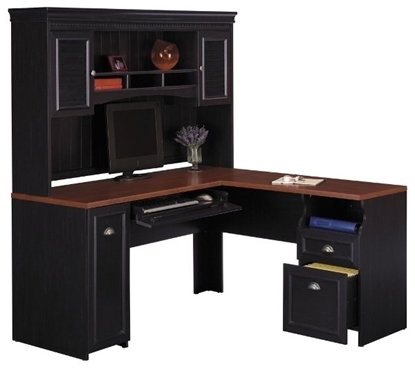 With modern trim design, it will fit well in a home office. Put it in the middle of the room or use it as a corner desk, you will appreciate its look and versatility. Free shipping on all discount office furniture. A great addition to any home office or private office. 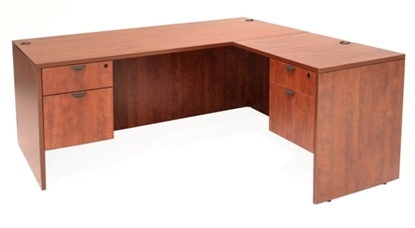 This 71"W x 78"D L-Shaped Desk with corner extension offers plenty of work surface area. This desk is available in a number of different finishes to match almost any office décor and features a durable 1" thick top. A great addition to any home or commercial office. 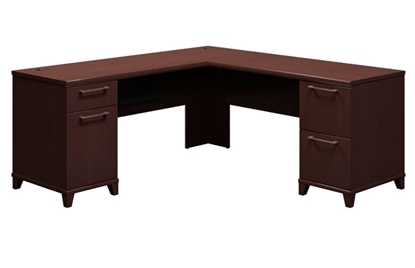 This L-Shaped desk is available in 4 colors and is supported by a Nickel colored metal frame. This unit also includes a mobile pedestal for all of your storage needs. Warm and elegant, the Embassy collection L shaped office desk by Bestar features stylish moldings, thermofused melamine finish, designer handles, and ball bearing slides. 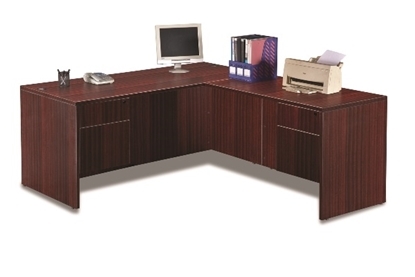 A desk with ample workspace, this L-shaped desk also has plenty of storage with its two locking suspended pedestals. 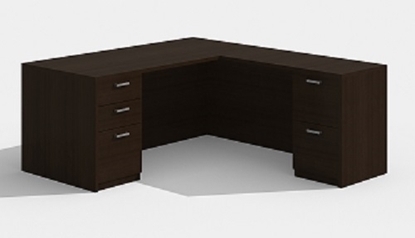 This desk features a 3mm edge banding and is constructed of thermally fused laminate. A great choice for the home or the office. This REVERSIBLE L-shaped desk includes two pedestals for all your storage needs, grommet holes for wire management, and a durable 1' thick construction. This item is available in 5 finishes with corresponding drawer pulls. 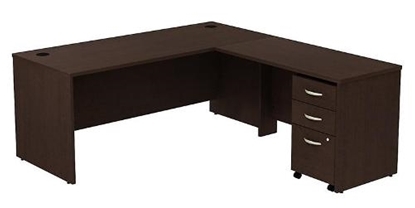 This Offices To Go L shaped Desk with Hutch features superior laminate construction, contemporary styling, and a strong and durable 3mm PVC "Super Edge". There is ample work surface space, good drawer storage, and off the surface space in the hutch. All OTG products are green certified, good for our environment. 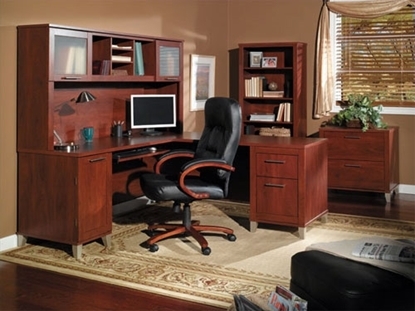 The Genoa office desk is the perfect choice for your office with many finish choices to compliment your surroundings. The eco friendly Genoa Series combines the value of laminate with contemporary styling.Thermally fused high performance laminate remains attractive and durable for years! Get free shipping when you order today! This classic design and great value is ideal for closed offices and wherever professionals work; reception areas, conference rooms, and work at home professionals. Series C is one of Bush Furniture's longest standing lines featuring durable construction, efficient storage solutions, and PVC edge banding that stands up to collisions and dents. Featuring a built in USB hub and high quality full extension ball-bearing sliding drawers this L shaped desk in the Bush Enterprise collection provides contemporary style, commercial grade office furniture at a discount price. Perfect for the home or business. Free shipping on all office furniture. Available in a rich Maple Cross finish with tapered metallic leg accents, the transitional Somerset Collection L shaped desk with hutch by Bush provides plenty of work surface area and storage. An ideal solution for a home office or small business. Free shipping and warranty available on all discount office desks. The Regency Legacy L shaped desk is functional and stylish in three finish options for your business or home office. Constructed of thermal-fused melamine laminate with a matching 3 mm PVC edge for durability. Free shipping and warranty available on all discount office desks.